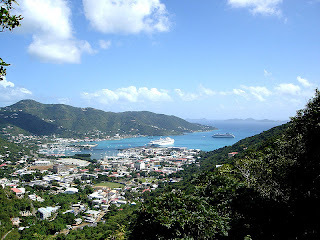 The Virgin Islands are an archipelago of islands in the Caribbean. The islands where initially discovered by Christopher Columbus in 1493. Upon sighting them, it is said that the islands reminded him of the story of Saint Ursula who went on a pilgrimage across Europe with 11,000 virgins. So, he named the islands the very fancy name Santa Ursula y las Once Mil Virgenes. This was then commonly shortened down to Las Virgenes (The Virgins). The islands themselves where first claimed by the Spanish, but first settled by the Dutch in 1648 who set up a settlement on the island of Tortola. However, they lost this to the English in 1672, who then proceeded to set up settlements on the major islands of Anegada, and Virgin Gorda. This gave the English control of just over half the archipelago, with the Danish gaining control of the rest. The British originally held the islands as a strategic claim, but with the introduction of sugar cane, the islands enjoyed a long period of economic prosperity. The islands where, and still are, officially called The Virgin Islands. However, in 1917, the USA purchased the islands held by the Danes, and renamed them as the US Virgin Islands. Following then, almost universally, the British-held islands where referred to as the British Virgin Islands. Initially the islands where governed as part of the British Leeward Islands, as well as from St Kitts and Nevis. 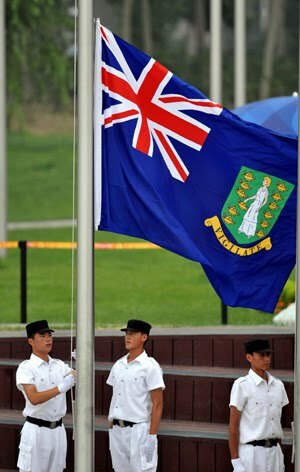 The islands finally gained separate colony status in 1960, and then in 1967, they became self-governing British territory. Since the 1960's, the islands have been slowly diversifying away from agriculture. The islands economy now revolves round tourism and finance, making it one of the richest areas in the Caribbean. The islands are represented by the standard blue ensign that is used by many of Britain's overseas territories. The ensign is defaced with the territories shield on the fly. 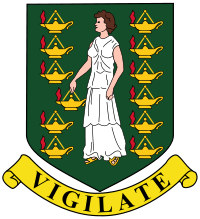 The shield for The British Virgin Islands is a simple green shield featuring a lady dressed in white holding a golden lamp. A further 11 golden lamps are arranged around the lady. Under the shield is "Vigilate." The territories motto. Translating as "Be vigilant" in Latin. The lady and the lamps are representative of the story of Saint Ursula and the 11,000 virgins. The flag was introduced in 1960, when the territory gained separate colonial status.